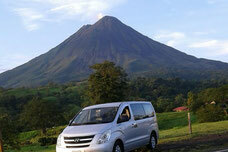 This excursion combines two of the main attractions in the area; we start with a visit to Arenal Volcano National Park which is located about 25 km (15.5 miles) from the center of La Fortuna. 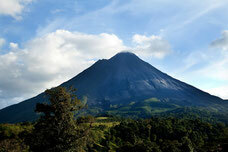 The hike has duration of approximately 2 hours during which you can hike in the secondary forests of the national park. There you will enjoy impressive views of the colossal volcano during the hike as well as arrive to an observation point where you can see Lake Arenal. At the end of the hike you can enjoy a delicious typical lunch in the center of La Fortuna before continuing on to your second activity. 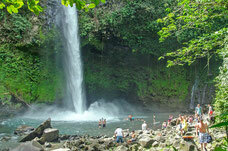 The La Fortuna Waterfall is located 6 km (3.5 miles) from the center of town and is a very popular attraction for tourists with its crystal clear waters and impressive 65 meter (200 foot) drop. The hike takes about 2.5 hours in total with a mix of trails and swimming holes where you can swim and enjoy the natural beauty characteristic of this part of Costa Rica.